Provide your patients with compelling visual evidence and provide important data for tracking posture changes and choosing appropriate posture rehab protocol. 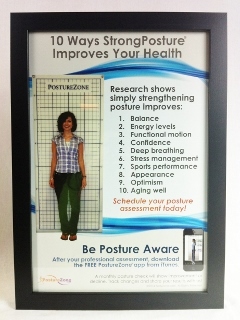 One look at their posture picture and patients naturally ask you, "what's next?" The posture grid is a quick, easy, and effective way to implement posture exercises with your patients and schedule follow up to document changes. The Wall Mount Grid is perfect for use at your practice - every office should have one! The wall mount grid measures approx. 36” x 82". Text and lines are printed in blue. The material is a durable translucent white flexible material. The in-office wall mount posture analysis grid is printed on flexible plastic material with grommets for easy hanging. A picture is worth a thousand words, and posture pictures provide compelling visual evidence for patients as well as providing important data for tracking posture changes and choosing appropriate posture rehab protocol. The horizontal and vertical lines make posture deviations easy to identify and explain to patients and clients, plus pre- & post- posture analysis pictures makes it easy to demonstrate increased symmetry and other changes. This is the number one posture grid on the market and is used by posture professionals; chiropractors, physical therapists, physiotherapists, massage therapists, dentists, Oro Facial Myologists, personal and fitness trainers, Pilates and yoga instructors, coaches, Alexander Technique and Feldenkrais practitioners, hospitals, researchers, athletic teams, clinics, colleges and universities internationally. I've been employing the grid – it helps me as I assess the exercises for wall tilts and alignment exercises (CPEP posture certification protocols). You see people gradually inch closer to the wall as a result of their work. It's nice to see the improvement, but also to let them know that they are making progress and that you are paying attention to that progress. It makes a difference in their determination and compliance. Just what I was looking for. Originally bought one from another company but it was just banner material and did not lay flat - sent it back. This one has very clean look and the posture images look right. Good purchase, helpful staff. Using a posture grid serves three purposes: recruiting, education, and documentation. Everybody likes to have their picture taken. Placing the grid in the office or at a lecture draws potential clients, and gives you a window to educate about the importance of posture. Once you’ve begun working with the patient, you can go back to the grid and show tangible improvements. Very high quality! Will last forever! Easy to hang with the grommets and makes identifying postural imbalances very easy. I would highly recommend this product! I didn't know what to expect in terms of durability when I order the PostureZone Grid. I was very pleasantly surprised! This will be a great addition to my assessment tools. We have started taking posture pictures of all new patients. The pictures are clean (no reflections) and patients are impressed with the professional grid. The Posture Grid Wall product description says it all. It is all that was advertised to be. It took all of 5 minutes to set up and enhances the professional clinical look of my office. Along with the Posture Principles Posters hanging nearby, this location of my therapy room provides an ideal meeting point for discussing implementing all activities regarding posture. Click the button below to add the Posture Grid – Wall Mount to your wish list.